There are some products I give into and rush out and buy, but for one reason or another don't work out for me. I tend to give any product many chances and either return it or gift it. Here are some things I bought into and am glad I did! My under eye area is very dark and I have tried several (extra emphasis on several!) 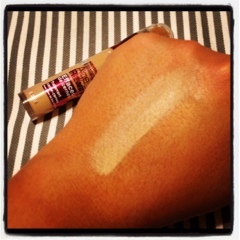 concealers and while I don't expect miracles, this does not sink into creases and does as good a job as can be expected. My mistake with concealers has been that I packed it on. What's worse than dark under eye circles? Pasty and visible creased concealer! MAC Studio Finish concealer is great for covering spots on my cheeks or chin- but under my eyes- not so much! 3. 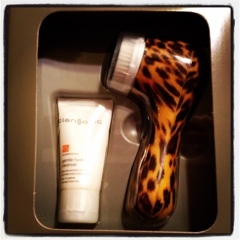 Clarisonic Mia- Sooo expensive but worth it in my opinion. I saved up my Birthday and Christmas Sephora gift cards for this and haven't looked back since. Ok- not entirely true. During the "purging" stage I was ready to return this and just deal with my cystic acne and blemishes that we're causing my skin to look really bad:( I had tried everything to try and get rid of my acne (prescription topical treatments, ProActiv, OTC Salicylic Acid) and while it helped somewhat I found myself using heavier makeup to cover up my skin. I've been using this since January and can say that my skin has cleared up significantly, I do get an occasional (hormonal) spot or two, it's nothing like the cystic (and sometime painful) acne that had been taking over my skin for most of last year! Love this!!! 4. Real Technique blush and stippling brushes- AMA-zing! Excuse the not clean brushes- but haven't gotten around to washing these this week! Adore these soft, fluffy brushes! More than my MAC brushes and for waaaay cheaper! I still want the core set and especially the buffing brush that has awesome reviews! 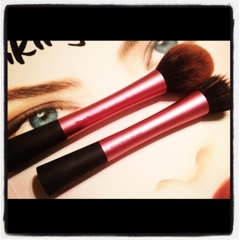 I did purchase the powder brush but ended up selling it in my blog sale. While it was soft and a good price, it was just too big! I found that it had my powder flying everywhere! No regrets on these two though! Does anyone else give in to hyped up products so eagerly/easily like me? I'd love to hear about products that you recommend! I love all you got there, specially Clarisonic and Real Techniques bruses, Can't wait to try them! About clarisonic, do you think it really works for acne, what does it do? Sorry to hear about your comment getting deleted. :/ disculpa! I def think the Clarisonic helps acne. The Clarisonic cleans 6 times more effectively than just washing your face. I did a lot of research on the Internet before purchasing it. I can't say that everyone would have the same results as I did- but for me this helped immensely! 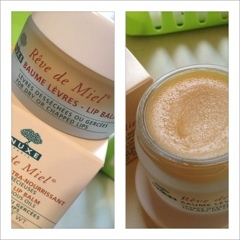 Gosh I want that Nuxe balm sooooooo bad! That and the Huile Prodigieuse. The Clarisonia Mia is good, but I honestly got the same exact results from a muslin cloth. Still, it's fun to use I guess--but I make sure to only use it about 2 times a week so I don't overexfoliate (especially since I use a product with a vitamin A derivative at night). Oooh, and I want to try the Real Techniques brushes so bad! I am a firm believer that you don't have to spend a crap load of money to get good brushes. Most of mine are Sonia Kashuk. Yes, you do need that Nuxe balm! I always thought any old balm would do- but now my lips truly do feel naked if I don't apply this at night! It's amazing! I've used a Muslin cloth as well but the clarisonic has been much better at clearing my acne. but for someone with good skin- I def think a Muslin Cloth would be just as well!